On December 11th 2014 was the Kick-Off meeting of the interdisciplinary I4D project, which was started by IML in October together with the Chair of Engineering Design and CAD (KTC) and the Chair of Distributed Control Engineering (PLT). The goal of the project is to create an integrated information and interaction space for industry 4.0 in Dresden. The Meeting was a whole success in the eyes of every participant, so that the way has been paved to implement prototypes of the planed concepts and to acquire additional research and industry partners during the next two years. 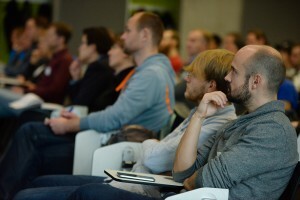 On Thursday, November 20th, we had an Open House Event at the Interactive Media Lab Dresden. The event took place directly after the international tabletop conference (ITS 2014), organized by the IMLD, and combined two exciting scientific talks by Dr. Sheelagh Carpendale and Dr. Miguel Nacenta with demos of our research prototypes. A buffet sponsored by MultiTouch Ltd. supplied our guests with the energy needed. Also, Dr. Tommi Ilmonen, CTO of MultiTouch Ltd., presented the technology behind our interactive multitouch wall and was able to answer questions. 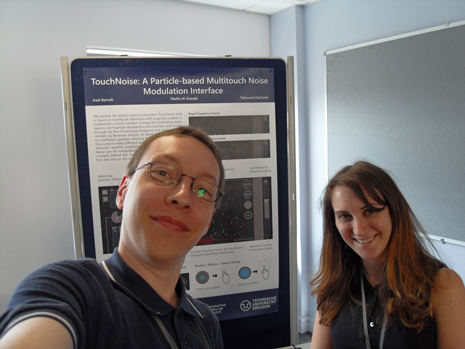 We thank MultiTouch Ltd. for sponsoring the event and all our guests for their interest in our research and the valuable, positive feedback. Additional impressions of the event can be found in our photo gallery. 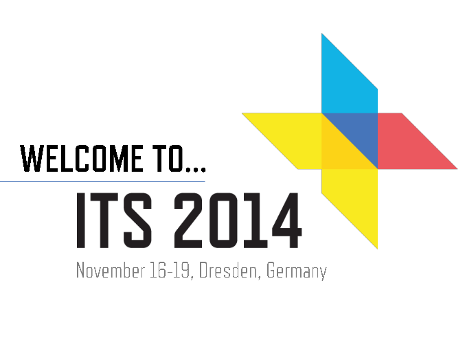 The International Conference on Interactive Tabletops and Surfaces (ITS’14) took place from Nov 16 – 19, 2014 in Dresden, Germany. As principal organizers of this years event, we were particularly keen to make these four days an enjoyable and pleasant happening. The hard work of Co-General Chair Raimund Dachselt, our team as well as all others involved has paid off. 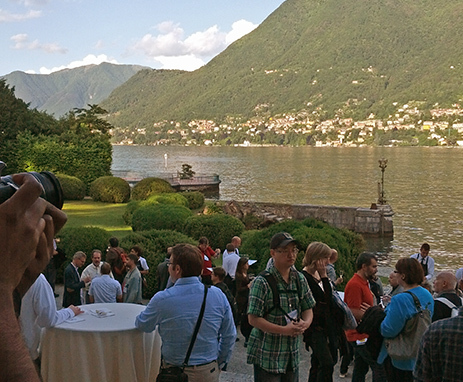 Catch some impressions of the conference at our photo gallery! We are happy to announce to exciting research talks in November. On Thursday, November 20th Dr. Sheelagh Carpendale and Dr. Miguel Nacenta are going to visit us. Starting 9.30 am, Dr. Carpendale is going to give a talk on Thinking about Interacting with Information in our Everyday Lives. Then, at 10.15 am, Dr. Nacenta is going to talk about Playing with perception, representation, and presentation: three ways to subvert current visualization techniques. Both research talks will take place in the lecture hall INF E023. Anyone interested is cordially invited! 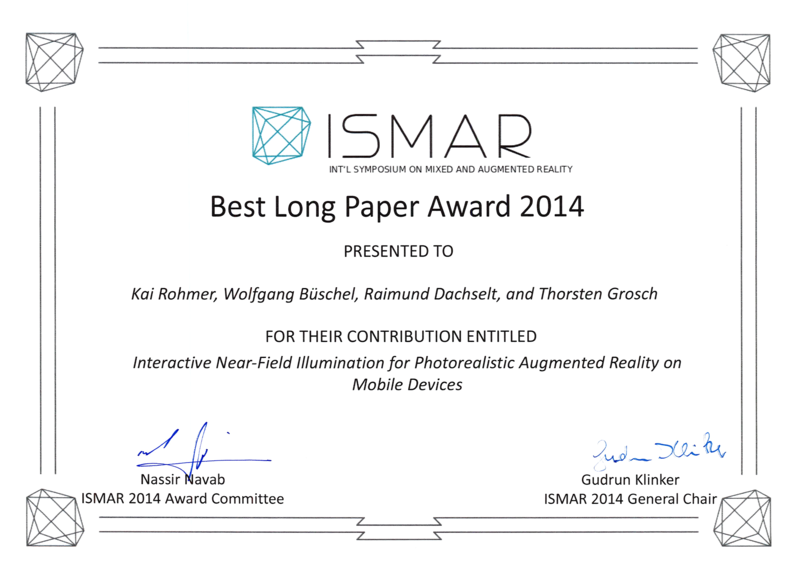 The paper Interactive Near-field Illumination for Photorealistic Augmented Reality on Mobile Devices, a result of the DFG project IPAR, has been honored with the Best Paper Award at ISMAR 2014. Kai Rohmer (Computational Visualistics Group at OvGU Magdeburg) presented the paper last week at the world’s leading conference on Mixed and Augmented Reality. 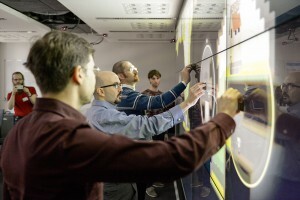 IPAR is a DFG-funded joint project of the Computational Visualistics Group and Interactive Media Lab Dresden. 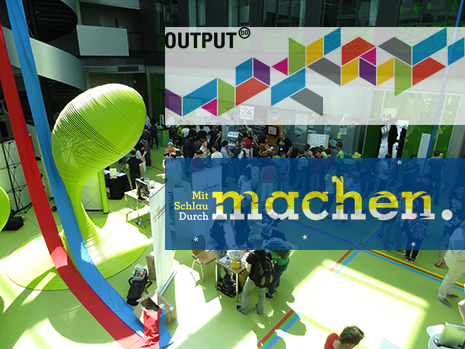 This year’s two big events, the 9th edition of OUTPUT, the project show of our faculty as well as the 12th Long Night of Sciences Dresden took place on July 3 and 4. Find exciting impressions captured on images at our photo gallery! 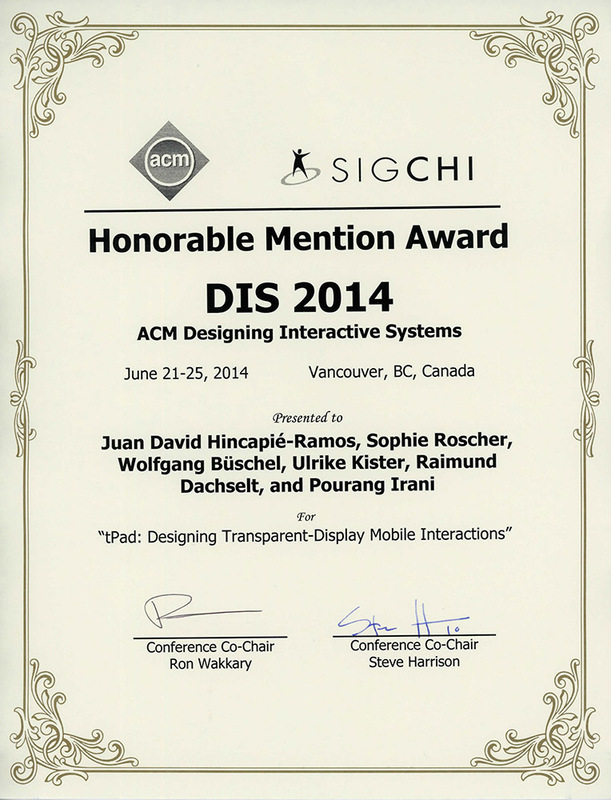 The paper tPad: Designing Transparent-Display Mobile Interactions, a result of the LEIF exchange program, received an “Honorable Mention” at this year’s DIS 2014. LEIF was a EU funded exchange program between Canada and the European Union. Professor Dachselt was the European project coordinator. We are pleased to announce another exciting talk on Friday, June 27, 1p.m. in our Dresden Talks on Interaction and Visualization series. This time Prof. Eva Hornecker will talk about Physical-Digital-Social Encounters : Exploring the Social Design Space of Physical Computing giving an overview of her research which explores applications and uses of physical-digital technologies in a range of domains, such as museum installations, urban media interventions, and the influence of alternative modality data representations on subjective user experience. The event will take place at the seminar room INF E023. Everybody is welcome to participate! 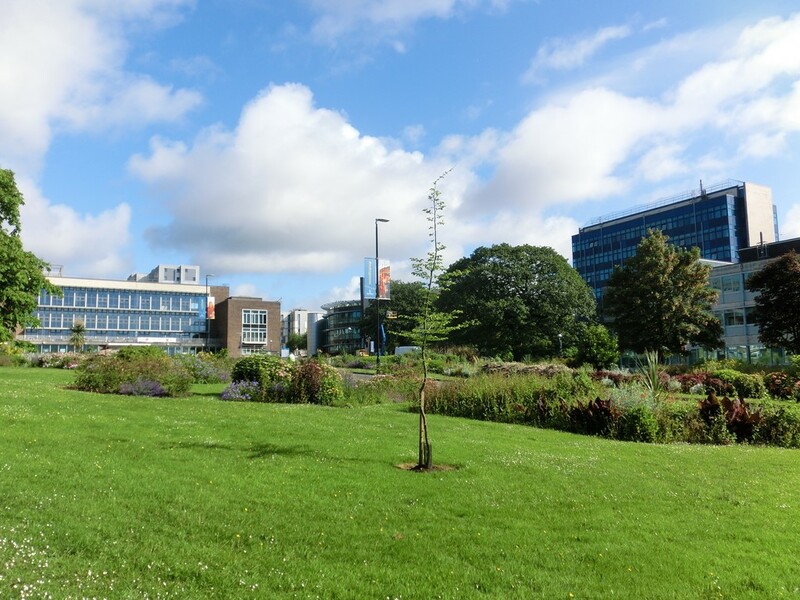 This year’s Eurographics Conference on Visulaization (EuroVis 2014) was located in Swansea, Wales. The focus of this conference is novel ideas for information visualization and scientific visualization. Ulrike Kister presented a state-of-the-art report on Interactive Lenses in Visualization together with our collaborators from Rostock in our project GEMS. In a 90-minute talk, they presented classification of magic lenses of different application areas. They especially focused on lenses for different data types and interaction tasks. Ulrike presented existing interaction modalities and display setups for the positioning and adjustment of magic lenses. In the last weeks, two conferences with successful participation by the Interactive Media Lab Dresden took place: Mai 27.-30., the AVI 2014 International Working Conference on Advanced Visual Interfaces in Como, Italiy and on June 3rd and 4th the International Symposium on Pervasive Displays in Copenhagen, Denmark. 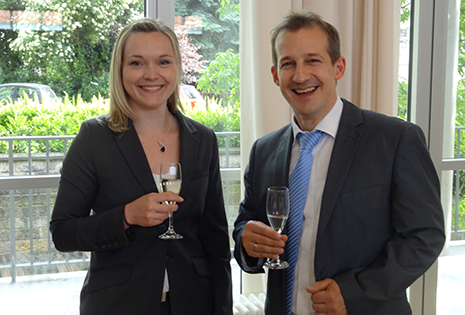 Sophie Stellmach, former member and PhD student at the Interactive Media Lab Dresden, received the prestigious Dr.-Walter-Seipp award of the TU Dresden and the Commerzbank Endowment on May 26th. The award was presented for her outstanding dissertation Gaze-supported Multimodal Interaction. “In her dissertation, Sophie Stellmach researches how human vision can be combined with other modalities to control future computers. Her work was received very well internationally and significantly contributed to the establishment of a new form of human-computer interaction.”, the jury comments. We congratulate her on this admirable achievement. Find some impressions of this event in our photo gallery. 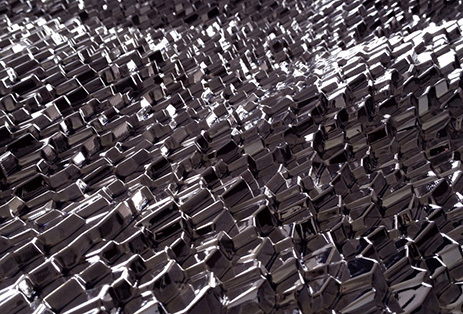 On Friday, May 23, Prof. Jussi Ängeslevä (Berlin Unversity of the Art) will visit us to give a presentation about the exciting topic Programming Material – Computational Design in Encoding Meaning to Physical Sculptures. Everybody is welcome to attend the talk at 1:00 pm in the lecture room INF 1004 (Ratszimmer). The largest conference on human-computer interaction, the ACM CHI, took place in Toronto from April 28th to May 2nd with this year’s slogan “One of a CHInd”. The Interactive Media Lab Dresden was also involved as Martin Spindler, Ulrike Kister and former student Martin Schüssler presented a full paper and an interactivity (photo gallery). Both Martins gave a talk about their research on Pinch Drag Flick vs. Spatial Input: Rethinking Zoom & Pan on Mobile Displays. In this paper, we compared traditional multitouch navigation on mobile devices with spatial movements for pan and zoom. Additionally, the application could be experienced as an interactive demo called Move Your Phone: Spatial Input-based Document Zoom & Pan on Mobile Displays Revisited. 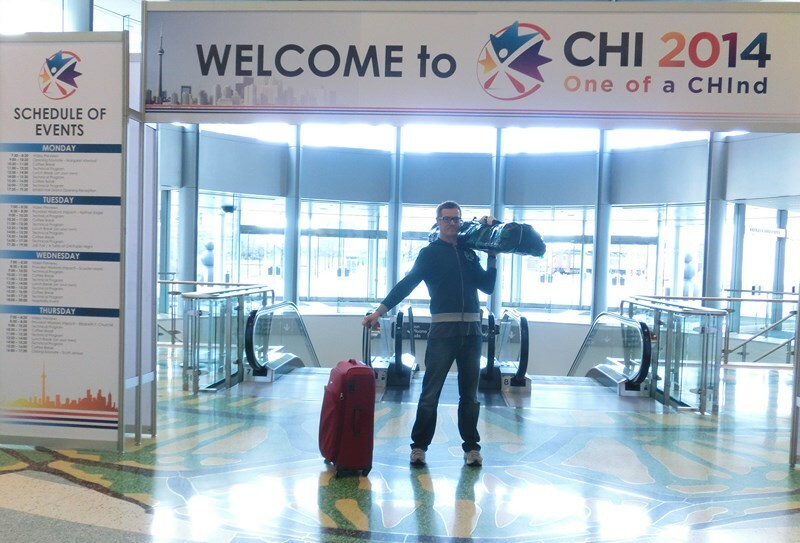 For this they brought a whole setup of cameras and tripods to Canada. Ulrike and Martin Spindler were also student volunteers who supported conference organization. We are pleased to announce two talks in our series Dresden Talks on Interaction and Visualization. On Friday, 9th of May 2014, Prof. Holger Theisel (University of Magdeburg) will give a presentation about Optimal Streamlines and Streamsurfaces for 3D Flow Visualization. One week later, on Friday, 16th of May 2014, you are invited to attend the talk of Fabrice Matulic (ETH Zurich) about Advanced Document Engineering on Pen and Touch Interactive Surfaces. He will show how UI designers can leverage the interactive capabilities of pen and touch platforms to build intuitive and efficient tools for the production of rich documents. Both events will take place at 1:00 pm in the lecture room INF E023 at our department. We are looking forward to seeing you there. This year’s season of the Dresden Talks on Interaction and Visualization is starting. The first talk will be given by Vlastimil Havran of the Czech Technical University, Prague on Friday, the 25th of April 2014 at 1:00 pm in the lecture room INF E023. Titled Bidirectional Texture Function Compression based on Multi-Level Vector Quantization, we expect an exciting presentation. We are looking forward to welcoming you. 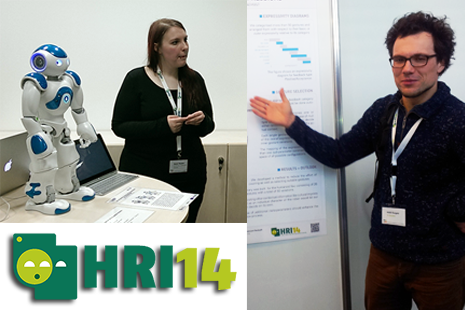 From 3rd to 6th of March 2014 the 6th ACM/IEEE International Conference on Human-Robot-Interaction, HRI’14 took place in Bielefeld, Germany. It was the first time our lab participated at the world biggest conference on Human-Robot-Interaction. 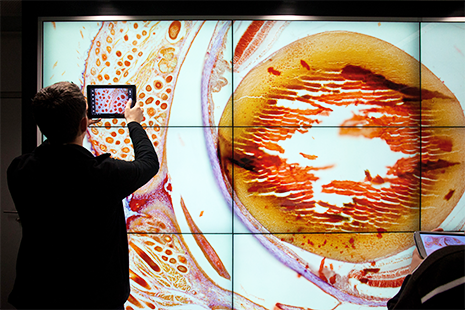 “Technische Universität Dresden (TU Dresden) introduces the largest interactive display wall in Europe used for research purposes”, MultiTouch Ltd. is stating in their announcement today. The full press release can be found on the official website. On Wednesday, February 12th at 3pm, we organize a short info event about possible thesis topics in room INF E010. Those who are interested in the topics of our courses and would like to write their thesis (bachelor, master, diploma, baccalaureate or Belegarbeit) are cordially invited. You will learn what we are working on at the moment and which topics we offer. Please register via mail (to: ramona.behling@tu-dresden.de, subject: Voranmeldung Themenvorstellung 12.2.) until February 10th, to allow us to plan the event.